High school teachers teaching vector operations refer to the three unit vectors i, j, and k, but probably don't realize where they come from. 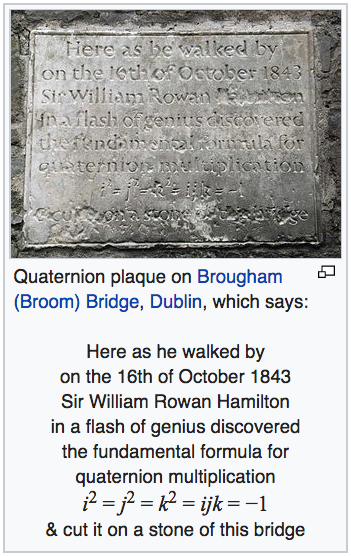 Quaternions are a number system that extends the complex numbers by introducing three quaternion units i, j, and k. A quaternion is the sum of a real number and real multiples of these quaternion units, q = w + xi + yj + zk. Quaternion multiplication is non-commutative.